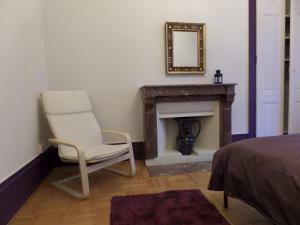 The RF14 Apartment by Castaway Lodgings price per day from CHF 159 The RF14 Apartment is a self-catering accommodation with free WiFi access, located in the heart of Geneva, within a 5-minute walk from the Cornavin Main Train Station and public transports. The apartment comprises a flat-screen cable TV, a seating area, a fully equipped kitchen with dishwasher, and a bathroom with bath tub, hairdryer and free toiletries. Le Jour et la Nuit price per day from CHF 255 Le Jour et la Nuit is located in a quiet area of Geneva and offers stylish and spacious rooms with free WiFi and a flat-screen cable TV, as well as a common kitchen that can be used by all guests. All of the modern and individually decorated rooms come with a terrace featuring city views, and a bathroom with a shower, free toiletries, and a hairdryer. Villa Esprit3 price per day from CHF 280 Set amid a large garden with a waterfall and pond, 3 km from the centre of Geneva and Lake Geneva, Villa Esprit3 is a stylish house offering rooms with free WiFi and a flat-screen cable TV. Adagio Genève Mont-Blanc (ex: Résidence Mont-Blanc) price per day from CHF 150 . Swiss Luxury Apartments price per day from CHF 1200 . Peaceful accommodation, 34 square meters, recommended by travellers ! InterContinental Geneva price per day from € 237 The InterContinental 5-star luxury hotel, newly redesigned offers amazing views of the Mont Blanc, of Lake Geneva and Geneva City. The spacious and elegant rooms at the InterContinental Geneva have free WiFi, free tea and coffee making facilities, are air-conditioned and feature cable TV..
Hotel de la Paix price per day from € 295 The historic and prestigious Hotel de la Paix Geneva sits majestically on the shore of Lake Geneva and enjoys sweeping views of snow-capped Mont Blanc. It is in the heart of the business district and only a short distance away from all of Geneva's attractions including the Grand Rue, St-Peter's Cathedral and the Old Town. Hotel Cristal Design price per day from € 105 The Cristal Design Hotel offers a quiet location in the heart of Geneva, next to the pedestrianized Mont Blanc street leading to Lake Geneva. All modern rooms are non-smoking, with individual air conditioning and soundproofed windows. Edelweiss Manotel price per day from € 114 Situated between Lake Geneva (200 metres) and the UN (1 km/half a mile), a few steps from Geneva's city centre, the Edelweiss Manotel radiates the charm of a genuine Swiss chalet. Relax in cosy armchairs around the fireplace and enjoy typical Swiss food like Fondue and Raclette in the restaurant..
1. Head west on Pl. Saint-François/Route 9 toward Rue du Petit-Chêne. 2. Slight left onto Rue du Grand-Chêne. 3. Continue onto Av. Jules Gonin. 4. Continue onto Av. de Tivoli/Route 1. 5. Turn left onto Av. de Tivoli. 6. At the roundabout, take the 2nd exit onto Av. de Montoie. Go through 1 roundabout. 7. At the roundabout, take the 2nd exit onto E23. Partial toll road. 9. Continue onto A1a (signs for Genève-lac/Evian). Toll road. 10. Take exit 2-Genève-lac to merge onto Route 1. Partial toll road. 11. Turn left onto Av. de France. 12. Continue onto Quai Wilson. 13. Continue onto Quai du Mont-Blanc. 14. Turn left onto Pont du Mont-Blanc. 15. Continue onto Quai du Général-Guisan/Quai Guisan. 16. Turn right onto Bd Helvétique. 17. Turn right onto Bd des Philosophes. 18. Turn right onto Rond-point de Plainpalais. 19. Turn right onto Bd Georges-Favon. Ski resort Blonay, number of cross country pistes: 20km. 65 km from town of Geneva. Ski resort Bourg-St-Pierre, recommended ski resort for experts. 86 km from town of Geneva. Ski resort Anzère, very good nightlife, many restaurants and pubs. 97 km from town of Geneva.